Recently, I bought both the SuperOcean Heritage 46 and 38 watches for my Fiance and myself as wedding gifts. We are getting married on July 11, 2009, and wanted to have a couple of Breitlings to commemorate the occasion. Since Much of my recent life has revolved around watches and Breitling more specifically, we felt matching Breitling watches were the way to go. So I set about finding an AD that offered a good price for the purchase, which I did. The SuperOcean Heritage 46 in Black is a very popular watch, and the wait time on that watch is approximately 6 weeks, which is what it finally took for the watch to arrive. But it sure was worth the wait! The SuperOcean Heritage 38 is a bit small for me, but to be quite honest, I think that is more than big enough for many wrists. It is slightly small by today’s standards, and while a men’s watch, we decided that it would be a good watch for my fiance as it would match very well with mine. It is a bit large on her wrist, but looks quite nice still. Here is a nice close up of the dial detail. You will notice that one of the Lume Dots is slightly off-centre. It isn’t noticeable to the naked eye really, but under a loupe or zoom up in a good macro shot its easy to see. Otherwise the dial is immaculate. You can see the slight bluish hue that comes from the double Anti-reflective coating on the Sapphire Crystal. A nice Bokeh shot with the SOH 46 in the foreground. I think these photographs turned out quite nice, with a slight bit of overexposure. The mesh bracelet is very cool, and fits VERY comfortably on the wrist. 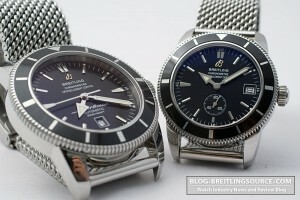 It is the most comfortable bracelet that Breitling has made, in my opinion. While the style of the mesh might take a while to really appreciate, the comfort is noticeable immediately. Bezel clicks very solidly and reeks of quality, as does the crown movement and case machining. Given the price of these watches, I do appreciate them better than the price I would have had to pay for matching Rolex Datejust watches. I probably paid just over half of what a matching pair of all-steel Datejust watches would have costed, and the mens watch would only be 36mm. However, the woman’s datejust does look better for women, I believe. 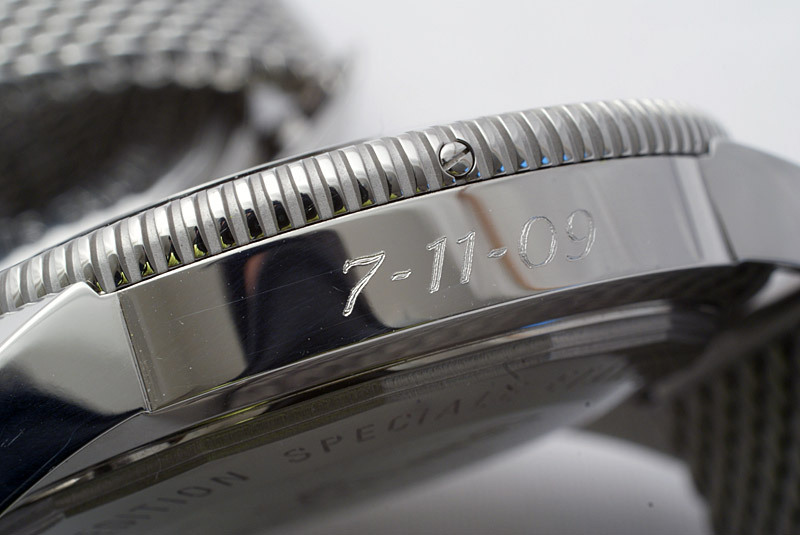 Here is a shot of the engraving done on the side of the watch. additionally we had our names engraved on the back in an arch, which turned out quite nicely as well. The case-side engraving was a really cool touch, and feels a bit more permanent than the engraving on the caseback, which is something that we liked about it. As an Art Director of a Design Company, I really like your shots. Since I was circa 20 years old, errr some 30 years ago, I have always been a Rolex fan and have owned almost every Rolex in the range, I remember my first Daytona with a Zeneth movement that I purchesed for circa £5500 that I have recently seen for sale for over £8500. Problem is, I bought it as I loved the design and felt that I would own something almost unique. When I went out to eat the weekend of my new purchase, I was thrilled to be sporting my graet new Rolex. You can guess what I am going to say can’t you? For a watch so much in demand and so short of supply, I must have counted atleast 4 other guys with the identical watch, only difference is, I did’nt own the Ferarri outside. Anyway, I recently sold my lovely Rolex GMT Master 2 as I got fed up with the green second time zone hand and am now watchless. I have been carefully searching to firnd something that I really like and have tried on the Heritige Chrono on the metal strap, I think it is beautiful, then I started looking more in to Breitling watches and also like the Blackbird, O and theCronomat with the black dial with silver sub dials, I also love the simplicity and elegance of the 46. I am still trying to decide. But soon I will be joining the Breitling team and leaving my roots forever. Unless that is that Rolex bring out a new larger Sub. Hust to say that I wish you and your Wife a very happy and healthy future together. Guess you must be on your honeymoon right now. Thank you very much! I am writing this from a hotel in Thailand. Actually, Rolex has brought out a larger sub in the new SeaDweller Deepsea. It is very large, and very nice! Having said that, I am more of a Breitling Guy overall than I am a Rolex guy and personally think the design of the Chronomat and Blackbirds are superior, especially when the new B01 movement makes its way into more models. I have a superocean heritage 46, damn fine watch. I just bought my Heritage 46 black/steel bracelet last week and been utterly happy ever since. 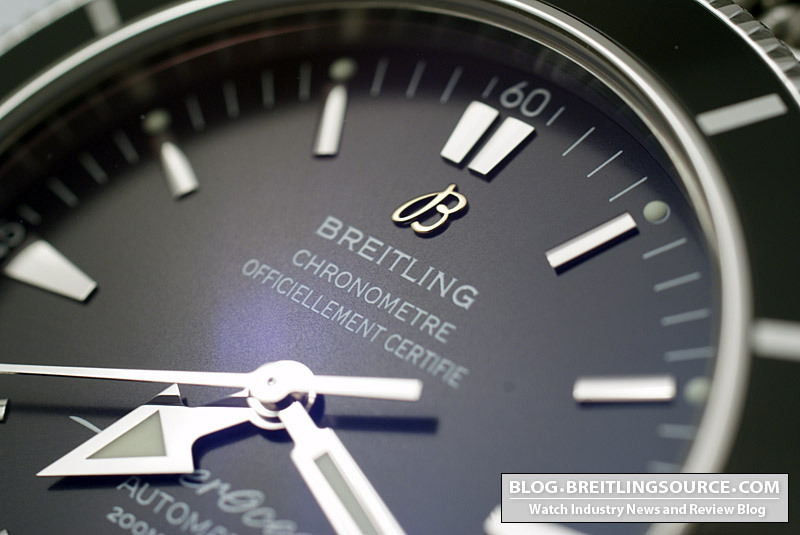 Ever since I followed toys for big boys Breitling was the benchmark of watch craftsmanship to my knowledge. Nevertheless, after a lot of traveling and interaction with unique & obsessed individuals for horology and wrist timing, I became educated meticulously about several other brands which even worsened my watch addiction more. (perhaps they might be politicaly correct). But started to study their sheer elements and philosophy, and at the end, I felt most comfortable and soul-mated with IWC. 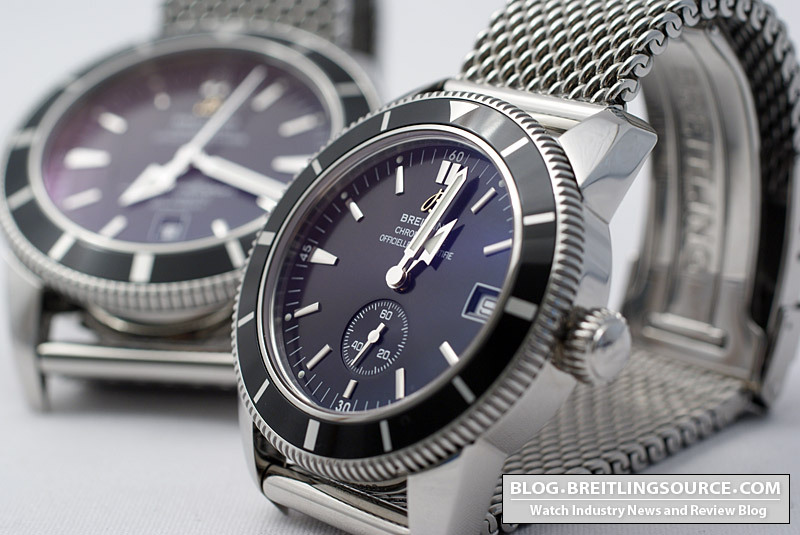 Now I don’t how just felt after reading the last sentence, but to my view IWC just completes Breitlings existence and sculptures it by many means. Just when I lost faith in this weird feeling that I have, he proved me wrong.You see I generally felt that those who wear Rolex, will prejudicely stay with it and never discover the beauty of the huge choices. I don’t have any personal agenda really about Rolex, it’s just the fact that it’s TOO recognized and isn’t kept exclusive in terms of image and opulence. It was always hard to digest the same routine that everybody follows. I say , since there are more than 100 proper watchmakers, why do the mass have end up choosing the MASS PRODUCER. Lets not get dragged away, shall we..
Bottom line, it took a big courage to sell my gift watch and put a big chunk of my beloved savings on the top and buy the IWC BIG PILOT which is the flagship with 7 day power reserve 46.2 mm. For me, no other watch gave me the best feeling when I was trying on most available watches when buying. ( I’m talking about Selfridges & Harrods). Although I should add that I don’t do my shopping from there. I confess, I did first wanted the Panerai new generation that comes in 47mm!!! but it was a serious purchase and would make no sense of buying a practical daily watch. I hope you find my comment interesting! enjoy everyday of life as it’s precious! Hey man congrats on the watches and not to forget your wedding. Hope you are doing great both ways !! I have decided to gift my self a breitling for my birthday which is 3 weeks away. I am very confused b/w the SOH CHRONOGRAPH and the Super avenger with the new baton markers. Off late reading the reviews online and seeing the pictures, the wire mesh bracelet and the understated elegance of the SOHC is slowly seducing me….on the other hand, the sheer size of the super avenger is hard to dismiss straight up !! If it is your first Breitling, I would suggest the Super Avenger since it is probably becoming one of the more iconic Breitling models. The SOH is a beautiful watch, and arguably has close to just as much wrist presence, however the Super Avenger serves a purpose, and that is sheer size and wow-factor, and as far as that goes, very few watches can compete with it in that area. The SOH to me is more of a second Breitling than a first Breitling. 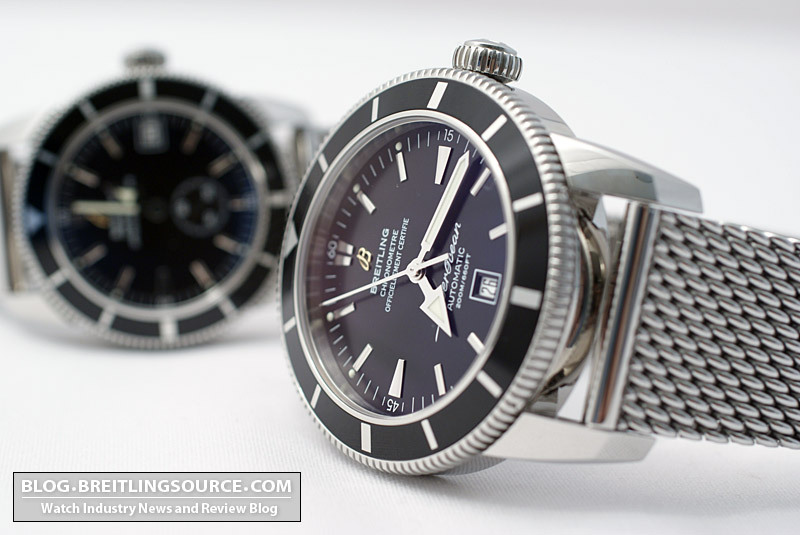 The Breitling Super Ocean Heritage has a really great retro look! If you’re going to spam my blog to try and get people to your freeman jewelers site, at least post something with value. I too have a SOH 46 what a stunner it is I bought it Oct 2009 but these last three weeks it has started to gain 3 minutes each week. The first time it happened I naturally turned the watch back three minutes to the correct time, the second time it happened I stopped the watch for three minutes exactly using another highly accurate time piece, when I did this the date did not move on the next day, now it is happeneing again. Has anybody any ideas why this may be happening and does this watch need to go back to the Breitling dealer for tests or recalibration? Maybe I have done something wrong by trying to correct it? The watch may have gotten magnetized, which can cause it to become unnaturally fast. As for the date, I’m not sure unless you tried to adjust the date between 9pm and 3am, which can damage the date wheel. 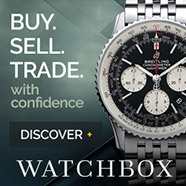 Either way, the watch should be looked at by your dealer or a service centre. I was wondering whether the purchase comes with a certificate of guarantee? As some places that I went to, said that it does not have any, but when I look at the watch website,there is. Please confirm. Not sure what you mean by a certificate of guarantee? What would it be guaranteeing? If you can tell me I can answer. Have to agree, its a fantastic, beautiful watch. I spent last week looking for a good everyday watch, I spent a week looking form IWC to Seiko (New and second hand) and I finally decided on the Superocean Heritage 46 with the steel bracelet (Green bezel which I know it won’t be everyones cup of tea but I liked it as it stood out more, not because its a limited edition). It is one of my favorite watches in my collection. Congrats on the SOH 46! It is indeed a great watch. I have a rolex datejust and an soh 46 with the blue rubber band. I’ve gotten in a pattern of wearing the datejust when I dress formally and the sho for casual attire. Thinking about getting the mesh band for more use. What do you think? I love my mesh bracelet… I do enjoy throwing it on a Rubber with deployant sometimes, however. I have a question that is going to deviate From the review, what does the testing of a watch for chronometer status entail?,this might sound kinda stupid but couldnt any automatic be a chronometer if regulated well enough? Thinking of purchasing both the 38mm and the 46mm. I live in ireland and the watch is very expensive here due to taxes. I would be grateful if you shared with me the dealer you bought it from. Hi Ronan, I purchased it from La Swiss in Yorkdale Mall in Ontario Canada. I don’t think you’re going to get an especially good price necessarily from them though. Hello, I am looking to buy a SuperOcean Heritage 38 black new. Do you have any site to recomand? That’s a harder watch to find new because it was discontinued a while back. I would try some dealers like Govbergs in the USA, or Andrew Michaels in UK. I guarantee you all of you have either put your 46’s in a box or sold them. And considering how much of a twit the author is I can almost guarantee him and his “wife” aren’t together anymore. Because the first real man that sees the date on his wife’s watch will tease her about it and that’ll be it. Just because you can’t keep your wife without flaunting a Rolex doesn’t mean other men can’t. I still have my Heritage 46, and a few Rolexes too. So… the 38 for the lady? May I ask if she is more of a strong body type? I think the 38 wears well on most male wrists without being as much “in your face” as the 46 which is bordering Invicta-Diesel-ridiculous in my opinion. Not particularly. She’s sort of an average size I would say. Great that you got both, they are both great Timepieces. We carry both models. Nice piece of wrist jewelry. They don’t make the 38 anymore.. you still carry it?